NEW YORK (AP) -- Marlene Dietrich, seen on the screen for years as the glamor star that she is, has turned her talents to radio. She has a Thursday series on CBS, after a season on ABC. Using just her low, caressing voice to depict the drama she once displayed in visual glamor, she calls the program " Time for Love," a mixture of international episodes, romances and mysterious adventures. In the radio drama, with each broadcast a complete story, she playes Diane Le Volta, a cafe Chanteuse who gets involved in all sorts of intrigue. She relies on the throaty quality of her voice and the "hallo" introduction of each program to provide a mental picture of this individual. Miss Dietrich is working for the same network which has been starring her daughter, Maria Riva, in its TV division. Maria has appeared in numerous outstanding TV dramas between household duties which includes the care of two sons, a part in which Grandma Marlene sometimes cooperates by baby sitting. NEW YORK (UP) -- Marlene Dietrich, the movie glamour queen is quite happy with things as they are. She is on radio and not in television. "I own my own radio show," she explained. "It is written and directed as I desire, it calls for a certain amount of activity without requiring me to work to the point of collapse, and I have a sponsor who pays me good money. It is a nice arrangement and I like it." She's still appearing in the movies, she pointed out, for the benefit of those who feel she has other beguiling assets besides her voice. "I have no idea when I might do television," she continued. "There have been many offers. For the present I am content to sit and watch it. They are improving it all the time. "Besides I have never been one to jump into new things just for the sake of doing something novel. There doesn't seem to be anyhting for me to gain by doing that." The perennially shapely and beautiful star devised the formula for her radio show and works constantly with the writers on the scripts of "Time For Love," which is on hte CBS network each Thursday. Miss Dietrich, of course, knows plenty about television. She's watched her daughter, Maria Riva, become a TV dramatic star after a brief stage career. "The amount of work involved is unbelievable," Miss Dietrich commented. "The movies are restful by compoarison. I sometimes wonder how my daughter manages to do two or three hour-long dramatic shows a month." Her son-in-law, William Riva, one of the better young set designers, is now on the design staff of the National Broadcasting Company. "You never know at what hour of the day or night he will have to rush through a designing job," Miss Dietrich said. "He has about as much regularity in his life as a doctor." Their hectic working situation in the Riva family sometimes gives the star her favorite job--babysitting with her two grandsons, John Michael and John Peter Riva, aged five and three respectively. "I don't get to do as much of that as I would like to do," she said. 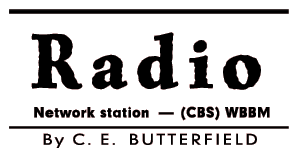 "Some nights I have to devote to my own baby--the radio program." 8 p.m.--Time for Love (WKOW): new series starring Marlene Dietrich: "Meeting in Venice," story of chanteuse and writer in love. Premiere . . . (8:00 p.m.) Glamorous Marlene Dietrich makes her debut in a new dramatic series, "Time For Love" for Jergens. 8 p.m.--Marlene Dietrich (WKOW): "Reunion in Paris." 8 p.m.--Marlene Dietrich (WKOW): "The Lady and the Bullfighter." 53-01-29 San Mateo Times - "Time for Love," heard on KCBS, 6 o'clock, features Marlene Dietrich as the sultry voiced Diana La Volte on "The Adventure of the Book." "The Lady and the Bullfighter" is hte title of tonight's episode in the weekly Marlene DIetrich series, Time For Love, over WBBM-CBS at 8 o'clock. 8 p.m.--Marlene Dietrich (WKOW): man loses $3,000,000 in diamonds at gaming tables. TIME FOR LOVE--"The Lady and the Bullfighter" starring Marlene Dietrich. WGAR at 9. 8 p.m.--Marlene Dietrich (WKOW): "The Jewel Robbery." 8 p.m.--Marlene Dietrich (WKOW): "Adventure in the Alps." An airplane crash, a near-murder and a Fascist push for power are told in Marlene Dietrich's "Time for Love" on KCBS at 6 o'clock. 8 p.m.--Marlene Dietrich (WKOW): blackmail in Naples. 53-02-26 Peoria Journal Star - "NEAPOLITAN INTERLUDE" starring Marlene Dietrich in a drama of a gangster exiled in Naples and an attempted blackmail, will be presented on Time for Love" (WMBD) at 9 tonight. Diana LaVolta, played by Miss Dietrich, manages to get the gangster out of the country. 8 p.m.--Marlene Dietrich (WKOW): Diane La Volia sings "Ask Me Why." 7--Time for Love. "Cap Ferrat," a tale of French underground, stars Marlene Dietrich (KCNA). 8 p.m.--Marlene Dietrich (WKOW): introducing song, "Time for Love," by Alec Wilder. 53-03-19 New Orleans Times-Picayune - Marlene Dietrich stars in "Chapter in Singapore" on Time for Love via CBS-WWL (8 p.m.). 8 p.m.--Marlene Dietrich (WKOW): fiery Latin tries to get rid of his wife. 53-03-26 San Mateo Times - "Rio de Janeiro" will be the title of Marlene Dietrich's "Time for Love" drama on KBS at 6 o'clock. 8 p.m.--Time for Love (WKOW): "Marlene Dietrich in "Cairo." 53-04-09 Wisconsin State Journal - 8 p.m.--Time for Love (WKOW): Marlene Dietrich foils fake-diamond syndicate. 53-04-16 Wisconsin State Journal - 8 p.m.--Marlene Dietrich (WKOW): "Flight to Nowhere." 53-04-16 Tucson Daily Citizen - 7--Time for Love. Marlene Dietrich aids the British intelligence service with protection for an atomic project in "Flight To Nowhere," based on a true episode. 53-04-23 Wisconsin State Journal - 8 p.m.--Time for Love (WKOW): Marlene Dietrich in "Carnations from Cadiz." 53-04-30 Wisconsin State Journal - 8 p.m.--Marlene Dietrich (WKOW): "Carnations from Cadiz." Marlene Dietrich becomes embroiled in the smuggling of a mink coat in "Fur Coat" on "Time for Love," heard over KKKBS at 6 o'clock. 53-05-07 Wisconsin State Journal - 8 p.m.--Marlene Dietrich (WKOW): singer becomes embroiled in smuggling plan. 53-05-07 Indiana Gazette - CBS--9, Marlene Dietrich in "Fur Coat." 8 p.m.--Marlene Dietrich (WKOW): "Mill of the Gods," adventure with mad pianist. 53-05-14 San Mateo Times - "Mill of the Gods" will be the title of the Marlene Dietrich drama "Time for Love," heard on KCBS at 6 o'clock. 53-05-21 Wisconsin State Journal - 8 p.m.--Marlene Dietrich (WKOW): costume ball in Rome sets stage for jewel theft. 53-05-28 Wisconsin State Journal - 8 p.m.--Marlene Dietrich (WKOW): Scotsman saves singer's life. CBS--9, Marlene Dietrich in "Affair in Scotland." 53-06-04 Wisconsin State Journal - 8 p.m.--Romance (WKOW): series of love stories returns; "Latin Affair," adventure of diplomat in South America. Marlene Dietrich is recording several episodes of her "Time for Love" program in New York for the series which resumes on CBS Radio-KJRL Sept. 3. These advance transcriptions will make it possible for her to go to Paris in the fall to make a motion picture. 53-08-27 Wisconsin State Journal - 8:30 p.m.--Lewises Onstage (WKOW): story of child's reaction to parent's emotional crisis. 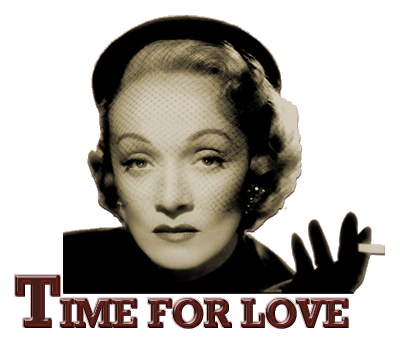 53-09-03 Wisconsin State Journal - 8:30 p.m.--Time for Love (WKOW): Marlene Dietrich's series returns. 53-09-03 Syracuse Post-Standard - Marlene Dietrich Star in WFBL's 'Time for Love' "Time for Love," starring screen and radio actress Marlene Dietrich, will return to WFBL at 9 p.m. today after a summer vacation. Miss Dietrich plays Diane La Volta, the international chanteuse who each week encounters adventure and romance. She is followed all over the world by Mike Victor, a successful American writer, who loves her madly. Mike Victor will again be portrayed by Robert Readick. The opening episode of the winter series, "Goodbye, Mike," is set in Paris. It deals with the proposed murder of a foreign statesman on a trans-Atlantic jet plane. 53-09-10 Wisconsin State Journal - 8:30 p.m.--Time for Love (WKOW): Marlene Dietrich in adventure of stolen emerald. 53-09-10 Syracuse Post-Standard - Time for Love, starring Marlene Dietrich, will be heard at 9:30 p.m. today on WFBL, launching its fall season. The first story is called "Marrakech Mirage," about a stolen emerald which turns out to be not so rare a jewel and about a group of international gangsters. The actress portrays Diane LaVolta, adventurous continental night club singer. 53-09-17 Wisconsin State Journal - 8:30 p.m.--Time for Love (WKOW): Marlene Dietrich in "The Maharajah." 53-09-24 Wisconsin State Journal - 8:30 p.m.--Time for Love (WKOW): anti-U.S. propaganda in Bombay. 53-09-24 Charleston News and Courier - "Incident in Casablanca" is the intriguing drama starring Marlene Dietrich as Diane La Volta brought to you by Jergen's products on TIME FOR LOVE, tonight at 9:30 over WCSC-Radio. 53-10-01 Wisconsin State Journal - 8:30 p.m.--Time for Love (WKOW): "Incident in Casablanca." 53-10-01 Mason City Globe-Gazette - Time For Love . . . (8:30 p.m.) Marlene Dietrich stars as Diane LaVolta in the "Episode Of the Golden Snake" on Jergen's "Time For Love." A deadly game of love, espionage and intrigue set in the mysterious splendor of Bombay! Glamorous Marlene Dietrich stars as Diane LaVolta in "Episode of the Golden Snake", on TIME FOR LOVE tonight at 9:30 over WCSC-Radio. Diane La Volta finds herself involved with a notorious outlaw on a Mediterranean island at 9 tonight when glamorous Marlene DIetrich stars in "The Bandit"--tonight's tale of adventure and romance on TIME FOR LOVE, over WCSC-Radio. 53-10-22 Wisconsin State Journal - 8:30 p.m.--Time for Love (WKOW): Marlene Dietrich saves a life, catches a criminal. LIFE SAVER: Marlene Dietrich as Diane La Volta will save the life of a friend and turn in a criminal to the police of Venice in "Dangerous Cruise" on radio's Time for Love program Thursday, Oct. 22 (8:30 p.m., CBS). From Antibes to Monte Carlo to Venice, the exciting story will move to a climax of a near shipwreck in the harbor. 53-10-22 Dallas Morning News - Dietrich to Rescue - Marlene Dietrich as Diane La Volta saves the life of a friend and turns in a criminal to the police of Venice, in "Dangerous Cruise" on "Time for Love" Thursday, KRLD, 8:30 p.m.
53-10-29 Wisconsin State Journal - 8:30 p.m.--Time for Love (WKOW): Marlene Dietrich in "The Bandit." 53-11-05 Wisconsin State Journal - 8:30 p.m.--Time for Love (WKOW): "Reunion in Venice." 53-11-05 Syracuse Post-Standard - Marlene Dietrich, as Diane La Volta, finds danger and espionage in "Reunion in Nice" on Time for Love at 9:30 p.m. WFBL. 53-11-12 Wisconsin State Journal - 8:30 p.m.--Time for Love (WKOW): Captured and taken to an outlaw camp in "Conquest of Fear." 53-11-19 Wisconsin State Journal - 8:30 p.m.--Time for Love (WKOW): "Night in Rome." 53-11-26 Wisconsin State Journal - 8:30 p.m.--Time for Love (WKOW): Marlene Dietrich rights a long-standing wrong. 53-12-03 Wisconsin State Journal - 8:30 p.m.--Time for Love (WKOW): singer rights a war-time wrong. 9:30, WTOP--Time for Love: Marlene Dietrich digs up memories of hte underground in "Recollection of Brittany." 53-12-10 Wisconsin State Journal - 8:30 p.m.--Time for Love (WKOW): espionage adventure on trans-Europe train. 53-12-17 Wisconsin State Journal - 8:30 p.m.--Time for Love (WKOW): great violin stolen. 53-12-31 Wisconsin State Journal - 8:30 p.m.--Time for Love (WKOW): "Earthquake." 54-01-07 Wisconsin State Journal - 8:30 p.m.--Time for Love (WKOW): singer saves diamonds from thief. 54-01-14 Wisconsin State Journal - 8:30 p.m.--Time for Love (WKOW): "The Lion Tamer," with Marlene Dietrich preventing a murder. DIETRICH DRAMA: A circus lion which has not been fed and an ex-Nazi in hiding provide a dramatic episode, "The Lion Tamer," on the Time for Love program starring Marlene Dietrich Thursday, Jan 14 (8:30 p.m., CBS). Miss Dietrich, as Diane LaVolta, prevents a murder and brings the criminal to justice. 54-01-14 Charleston News and Courier - A hungry lion and an ex-Nazi are the ingredients of thrilling drama at 9:30 tonight on TIME FOR LOVE. Be listening for Marlene Dietrich as Diane La Volta in "The Lion Tamer"--tonight's story of mystery and romance on TIME FOR LOVE, over WCSC-RADIO. 54-01-21 Wisconsin State Journal - 8:30 p.m.--Time for Love (WKOW): phony prime minister unmasked. 54-01-21 Mason City Globe-Gazette - Plot . . . (8:30 p.m.) It's a sinister plot to overthrow an Allied government on "Time For Love" starring Marlene Dietrich for Jergens. 54-01-21 New Orleans Times-Picayune - Marlene Dietrich stars in "The Mountain" on CBS-WWL's Time for Love (8:30 p.m.). Marlene Dietrich stars in "The Mountain" on CBS-WWL's Time for Love (8:30 p.m.). 8:30 p.m.--Time for Love (WKOW): plan uncovered to wreck North African economy with counterfeit U.S. money. 7:30--Time for Love. Diane La Volta (Miss Dietrich) halts a money-printing racket (KOPO). 54-02-04 Wisconsin State Journal - 8:30 p.m.--Time for Love (WKOW): "Counterfeit Money." 7:30--Time for Love. It seems the network decided to postpone this episode until tonight, despite previous publicity for another night. Marlene Dietrich now will pursue that gang of counterfeiters (KOPO). 54-02-11 Wisconsin State Journal - 8:30 p.m.--Time for Love (WKOW): "Trouble in Tanganyika." Diane La Volta uncovers a plot to smuggle ammunition to Africa at 9:30 tonight on TIME FOR LOVE. Don't miss glamorous Marlene Dietrich as the mysterious internation songstress in "Trouble in Tanganyika" tonight on TIME FOR LOVE, over WCSC-RADIO! 54-02-18 Wisconsin State Journal - 8:30 p.m.--Time for Love (WKOW): singer helps Spain's greatest bullfighter solve a problem. 9:30 WEEI--Time for Love, "The Man Who Wanted to Die" with Marlene Dietrich. 54-02-18 Boston Traveler - 9:30 WEEI--Time for Love, "The Man Who Wanted to Die" with Marlene Dietrich. Glamorous Diane La Volta visits sunny Spain at 9:30 tonight and meets "The Man Who Wanted To Die." For the thrilling drama of death in the bull-ring, be listening for Marlene Dietrich in TIME FOR LOVE, over WCSC-RADIO! 54-03-04 Wisconsin State Journal - 8:30 p.m.--Time for Love (WKOW): singer carries internationally-important papers. 54-03-11 Wisconsin State Journal - 8:30 p.m.--Time for Love (WKOW): revolution in South America. 9:30, WTOP--Time for Love: Marlene Dietrich, as Diane La Volta, finds herself a "Hostage" in a revolution in South America. 54-03-25 Wisconsin State Journal - 8:30 p.m.--Time for Love (WKOW): "Beauty and the Beast." Marlene Dietrich, as Diane La Volta, finds a strange intruder on her show in "Beauty and the Beast" on Time for Love at 9:30 p.m., WFBL. The drama is set in Brussels. 6:30 p.m.--Marlene Dietrich, "Beauty and the Beast," Time for Love, KOIN. 8:30 p.m.--Time for Love (WKOW): "A Trap for a Traitor" in jungles of Indo-China. 8:30 p.m.--Time for Love (WKOW): adventure in Italian automobile race. Marlene Dietrich, as Diane La Volta goes driving in the fastest racing car in Italy and meets adventure on Ride the White Horses on Time for Love at 9:30 p.m., WFBI. 8:30 p.m.--Time for Love (WKOW): singer quells revolution. 54-04-22 Tucson Daily Citizen - 7:30--Time for Love. A brief respite in an evening of heavy stuff. Marlene Dietrich stars in "The Voice of the Dictator" (KOPO). 8:30 p.m.--Time for Love (WKOW): Marlene Dietrich in "Fall Girl." 54-05-06 New York Times - 9:30-10--Time for Love: Drama involving "the Pharaoh's Curse," an ancient tomb and a long dead princess' jewels, with Marlene Dietrich--WCBS. The exotic land of Egypt . . . the towering pyramids . . . and the looting of a 4,000-year-old tomb! That's the setting for tonight's thrilling tale on TIME FOR LOVE, starring Marlene Dietrich. The drama is titled "Pharaoh's Curse." Don't miss it at 9:30 tonight, over WCSC-RADIO! 54-05-13 New York Times - 9:30-10--Time for Love: "Russian Roulette," Diane La Volta takes part in a gamble in which the stakes are human life--WCBS. 54-05-20 New York Times - 9:30-10--Time for Love: Diane La Volta spends a "Holiday in Portugal" and encounters a Tong war, with Marlene Dietrich and others--WCBS. 54-05-20 Portland Oregonian - 9:30 p.m.--Marlene DIetrich, "Holiday in Portugal," KOIN. Marlene Dietrich, as Diane La Volta, saves an innocent man who is condemned to death in a French prison in "You're Dead," on Time for Love at 9:30 p.m., WFBL. It's a drama of the sustaining power of the French underground. 54-06-03 New York Times - 9:30-10--Escape: "An Ordinary Man," a drama of romance on a Mediterranean cruise--WCBS. HOLLYWOOD, May 8.--Marlene Dietrich, the glamorous grandma, feels sorry for women who grow old. She thinks it's not necessary. For herself, she say she doesn't have time to grow old. "Most women don't have enough to do," she explained. 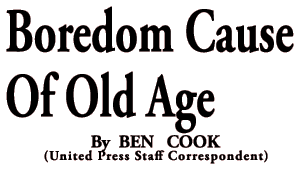 "Either that, or they have some sort of drudgery which ages them before their time. "Because they don't have enough to do, they are bored. Boredom ages one. They sit down too much. Sitting down makes you fat. They are envious of their husbands, who are busy, so they grow angry. Anger gives you lines." The solution, she said, is to stay busy, with many different occupations and interests. That way, she contends, one will never grown old. The formula has worked for her. She is one of the busiest women in the world today and conceded to be one of the loveliest. When RKO-Radio premiered her newest picture, "Rancho Notorious," in Chicago recently, Miss Dietrich appeared on the stage and sang several numbers. For her final selection she changed into the tights and form-fitting bodice she wears for one scene. There hadn't been such a chorus of wolf whistles since Sally Rand made her first appearance at the Chicago world's fair. There still isn't a pair of legs in Hollywood that can match hers for symmetry and grace and her complexion is smooth as a teen-agers. As for being busy, no one can doubt she is. She stars in a weekly radio show, "Cafe Istanbul," from New York. That would be a full-time job for lots of people. Still, she is in Hollywood already discussing her next film with Fidelity Pictures. She has another film on the fire to be made in Europe this summer and she is helping re-work the script. At the same time she is working on the script of play for which she is set to star this fall on Broadway. She also is eyeing a series of television guest shots as preparation for possibly taking "Cafe Istanbul" into video next year. For recreation, she keeps up a steady program of exercise and self-education. She tries to swim every day and plays tennis as often as possible. She keeps abreast of the current books and has a vast interest in music and art. She even dabbles in painting herself but admits her efforts meet with small success. She thinks the rapid aging of most women is a terrible tragedy that could be avoided if women would broaden their horizons, accept more responsibilities and undertake more cultural projects. "One never grows old," she philosophized.